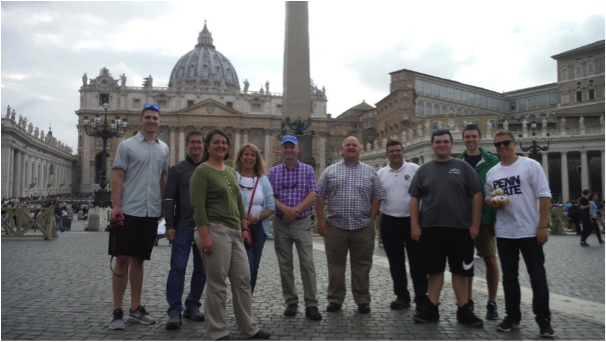 Ten undergraduate students, faculty, and staff from Penn State’s turfgrass program traveled to Italy during the second week of May as part of TURF 499 “Turfgrass Management Practices in Italy,” an international study course. The 3-credit course involved weekly lectures during the 2018 spring semester on golf course management practices and attitudes towards golf in Europe. The course culminated in an 8-day trip to visit several golf courses in different regions of Italy. 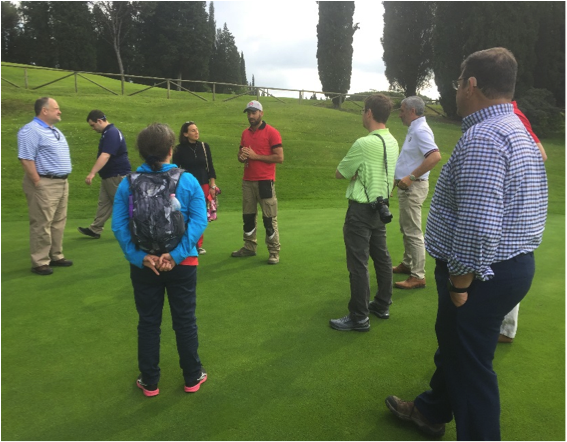 Italy was of particular interest because we wanted students to observe how golf course managers and owners are adapting to a recent ban on synthetic pesticides for golf course turf. Unfortunately, our trip was delayed one day due to an air traffic controllers strike at Fiumicino Airport; thus, we missed tours of three golf courses near Rome. However, our guide, Marta Visentin of the Italian golf Federation, was able to provide a quick tour of historical sites in Rome on the day we arrived, including the Appian Way, Colosseum, Forum, St. Peter’s Square, and Spanish Steps. On day 2, our group drove from Rome to Florence, a beautiful and historic city centered in the Tuscany region of Italy. Our guide arranged a brief morning tour of the center of Florence prior to visiting Golf Club Ugolino in the afternoon. Golf Club Ugolino is one of the oldest golf courses in Italy, and it is surrounded by breathtaking vistas of villas, olive trees, and vineyards. Despite a few weed issues and some small patches of dollar spot, the golf course was in very good condition. Head Greenkeeper Vanni Rastrelli discussed some of his organic approaches to pest control and emphasized good soil management as one of his keys to success. Head Greenkeeper Vanni Rastrelli explaining his organic approach to turf management at Ugolino Golf Club near Florence. After leaving Ugolino we traveled to Bologna, where we spent the night in a 15th century villa owned by a professor at the University of Bologna. The following day, Drs. 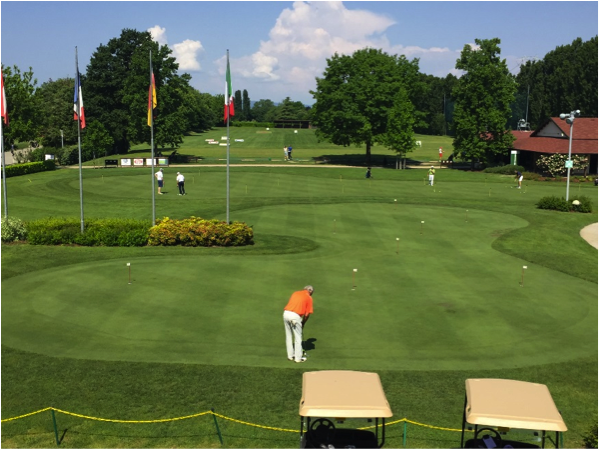 Landschoot, Kaminski, and McNitt gave presentations on turf-related topics to students, greenkeepers, and officials from the Italian Golf Federation at the University of Bologna (the oldest university in Europe – founded in 1088). After the seminar, we attended a reception at Villa La Babina where we enjoyed an exceptional buffet and a tour of the restored villa and gardens. Immediately following the reception, we travelled through the main agricultural production region of Italy to our hotel in Parco Regionale dei Colli Euganei, a mountainous area with numerous hot springs just outside of the city of Padua. We visited two outstanding golf courses near the park: Golf della Montecchia and Golf Club Frassanelle. The tour was led by Alassandro De Luca, an agronomist with the Italian Golf Federation and Director of Golf Course Operations at both clubs. Mr. De Luca spent most of the day explaining the importance of a sustainable approach to golf course management in Italy, as well as how and why both courses converted from cool-season turfgrass to bermudagrass. Following the tour, we were treated to a dinner reception at Golf Club Frassanelle by the club president. Practice area at Golf della Montecchia. 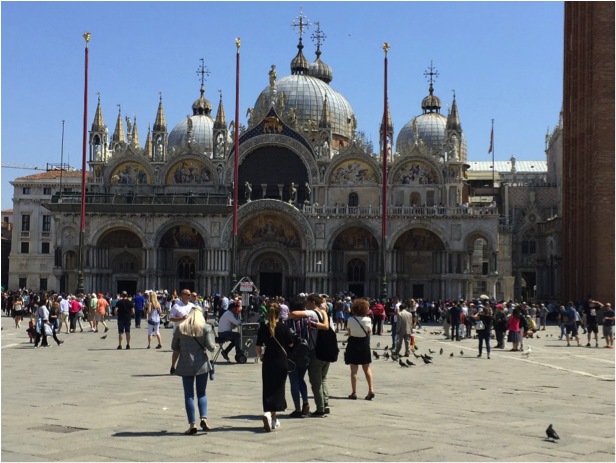 On Sunday morning, we boarded a train to Venice and spent the day exploring the palaces, piazzas, churches, and canals of what many consider the most beautiful city in the world. The next morning we took a 5-hour ride back to Rome and visited Golf Club Nazionale, just north of Rome and the historical Etruscan site of Sutri. Sutri is a medieval village with a nearby amphitheater excavated from volcanic lava dating back to the 6th century B.C. The final dinner of our trip was at a trattoria on beautiful Bracciano Lake. Basilica di San Marco in Venice. Our group traveled back to the U.S. on Tuesday, May 15. All TURF 499 participants, including the faculty, learned a great deal about golf course management in Italy. We also gained an appreciation of the history and culture of Rome, Florence, and Venice. Our group would like to acknowledge and thank our hosts for taking time from their busy schedules to provide excellent tours of their facilities. Hopefully, we will offer another international turf course in the future. TURF 499 students, staff, and faculty pose in front of St. Peter’s basilica in Rome.